The Linksys app allows you to securely access your home network using your mobile device. It gives you options to make changes on your network settings similar to the way you do on the Linksys Smart Wi-Fi from a regular web browser. 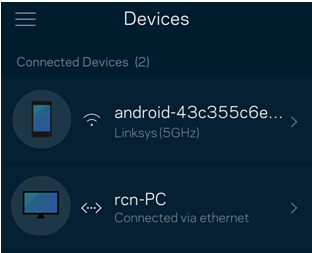 This article will provide instructions on how to view all connected devices in your network using the Linksys app. This feature will display both online and offline devices. Log in to your Linksys cloud account. For instructions, click here. You will be directed to the Dashboard. Tap the Menu icon (three bars). You should now see all the connected devices to your router. Each device will display either a Wireless Connection icon or an Ethernet Connection icon. 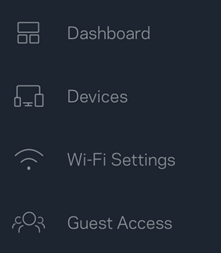 Wireless clients will also display the wireless band that the client is connected to. 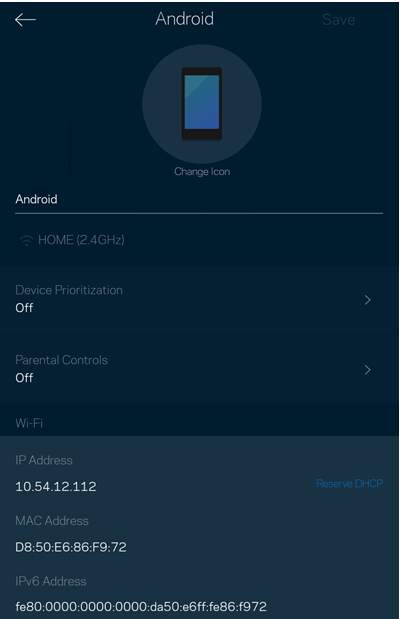 To view the device information, you can tap the name of your device. Once you select a device, you can view more information about the client, such as Device Name, the Wireless Network Name (SSID) that it is connected to, Device Prioritization status, Parental Controls status, IP Address, MAC Address and IPv6 Address information.